Dogwood trees are a favorite for their layered branching and spectacular early spring blooms. In fall, the tree acquires crimson hues and in winter, large buds tip stems and twigs. Dogwoods can be finicky about their surroundings, but once settled into the correct location with respect to soil and sunlight, dogwoods are easy to care for. Trees reach 15 to 20 feet in height at maturity and have a spread of at least 20 feet. Their horizontal branches soften the vertical lines of homes, and dogwoods can make a stunning backdrop to flowering bushes such as the azalea. Dogwoods are an understory tree, meaning they are used to growing beneath the canopy of pines and hardwoods in the forest. As a result, dogwoods prefer partial shade. Filtered or dappled shade throughout the day or a half-day of sun with the rest of the day in shade are preferred sunlight conditions. Too much sun weakens the tree and stunts its growth, inviting pest and disease attacks. Too much shade affects the quality and quantity of blooms. 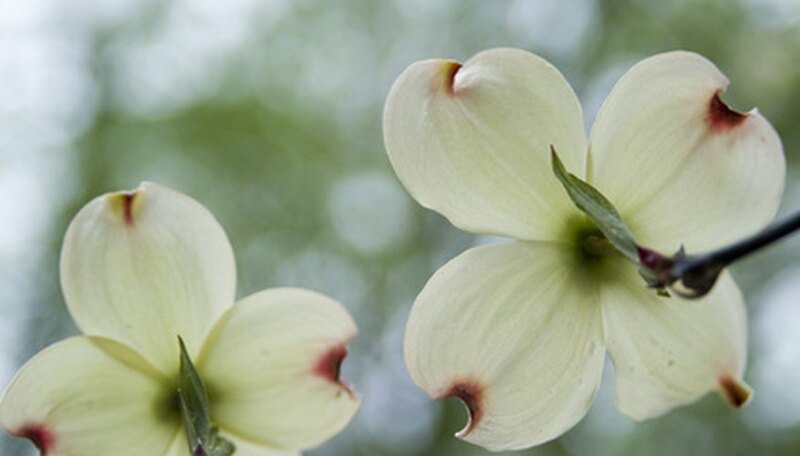 An Oriental variety, the kousa dogwood, does seem to do well in full sunlight according to the North Carolina State University Cooperative Extension. Dogwoods are the first trees to show signs of problems in drought conditions. They require plenty of water but not so much that roots are continually soaked, a problem that could cause the roots to rot. Supplemental watering once or twice weekly during dry summers and autumns are important even for more mature trees. Dogwood roots are shallow and branch out more than they dig deep, so watering to a depth of about 6 inches promotes good health. Dogwoods prefer well-drained, acidic soil with a pH of about 5.5. A high percentage of organic matter in the soil benefits the tree. The tree does well with a layer of slowly decomposing mulch rather than commercial fertilizers to supplement soil nutrients. Dogwoods are sensitive to rapidly changing soil conditions, so adding organic matter on top of the soil instead of in the planting hole provides a slower release of nutrients. Dogwoods pulled from forests do not typically do well when transplanted. Soil, sunlight and watering conditions must be duplicated exactly, which could be a tough task. Many dogwood trees transplanted from the forest eventually die. Nursery-grown trees fare much better since they are raised in more controlled conditions.